Life is a funny thing, don’t you think? We go through seasons. Sometimes those seasons are sunny and full of birds singing and flowers blooming (plastic flowers, if you have allergies). Then, other times, those seasons are full of stormy clouds and pelting rain. Those clouds can get low enough and that rain heavy enough that our visibility is reduced to almost zero. All we can see is what’s right in front of our faces. I’ve recently found myself in one of those dark and dreary seasons, and it’s gotten me to wondering. Scripture tells us not to worry about tomorrow, that today has enough worry of its own. And Jesus tells us – promises us, really – that in this life we will have trouble…but that we should take heart because He has overcome this world. Which leads me back to my wondering. When we’re going through a season with little to no visibility, when we can’t see more than a foot in front of us, what are we supposed to do? How are we supposed to handle it? I’ve come to the conclusion (not for the first time, so maybe that means I’ve “re-come to the conclusion”) that we’re supposed to handle these seasons in life just like we should handle the sunny happy days. We’re supposed to trust God to put a stone under our foot with each step we take. We’re supposed to trust that He holds all of our tomorrows in the palm of His hand, even when we can’t see those tomorrows. We’re supposed to focus on the here-and-now and not stress about those things over which we have no control. We’re supposed to know, deep down in our souls, that Jesus has overcome this world. We’re supposed to lean on that, rely on it. Trust it. Live it. Breathe it. Sometimes it takes a stormy season to remind us of those important truths, but that doesn’t change the fact that we should be living every day like that – not just the stormy ones. What important truths have you learned (or re-learned) during the stormy seasons of your life? TRACEY HAGWOOD is the winner of the $15 Amazon gift card from Lee Tobin McClain’s September 1st post. RENATE is the winner of the e-book copy of The Outlaw’s Second Chance from Krista Phillips’ September 2nd post. BRITNEY VASQUEZ wins one print book for herself and one for a friend and LAURA also wins a print book from Sally Bradley’s September 7th post. On Monday, Alexa Verde talked about real-life research for books. On Tuesday, Heather Gray (yeah, that’s me) pondered the oxymoron bittersweet. On Wednesday, Annalisa Daughety chatted about getting organized in space and time. On Thursday, Sally Bradley shared about the audio book for Kept. On Friday, Deb Kastner celebrated National Ampersand Day with some wordplay. On Saturday, Janet Ferguson dishes on her upcoming release Magnolia Storms. Hi Heather, I appreciate how you said we re-learn! I find my self having to re-learn and remember during the stormy seasons. For me- patience! Keep breathing and know that with God, I can get through the storms. Blessings and prayers to those in cyclone and bushfire affected areas. I once read an article on parenting – long before I had any children. It said that parenting teaching you something new everyday. Some days it teaches you patience. Other days it teaches you patience. Then, on still different days, it teaches you patience… I always chuckle when I think of that. You are so right, though! Patience is this thing we have to keep relearning – or learning better – because every time we think we’ve mastered it, something comes along to prove to us how little we’ve truly grasped it. ;) And yes! Raising prayers for everyone in all the affected areas. Weather is wreaking havoc everywhere, but we the news only seems willing to let one story dominate at a time, so we don’t hear about so much of what else is going on. This has become my fight son, my motto, trust Him no matter what. He has never failed me. Thanks to Lee Tobin McClain for the Amazon gift card, such a wonderful blessing I appreciate so much! Hi Heather! Relearning is a big part of life. During the stormy part of life, I try to remind myself to take one day at a time. So often one becomes overwhelmed. Also regardless how dark the situation looks, God is in control. His ways are best, even when I do not see it at the time. Congrats to all the winners. Thanks Krista Phillips for the win. Prayers for Florida, Texas, Mexico (earthquake), and Western areas with the raging fires. Best wishes. Absolutely Renate! After all, scripture tells us that no good comes from borrowing tomorrow’s troubles – today has enough of its own. One day at a time. We can step through today knowing that God is holding tomorrow. Amen! This is a great post. A great reminder. Hope your dark season ends soon, that you learn something special from Jesus during this time. Thank you so much Lori, and what a beautiful way to put that. I believe I am learning something special from Jesus during this season. In part, I think He’s growing me. And in part, I think He’s showing me how much He’s already grown me. Sometimes we forget that. It’s okay to look back now and then and see how far Jesus has brought us and to be amazed at the grace of God at work in our lives. This weekend I’ve been telling myself, sufficient for the day are the troubles thereof. I tend to worry trying to figure out the details, but….God has them in control. I’ve often heard the phrase, “The devil is in the details.” And I know it’s meant to be a humorous phrase, but still… My children, when they were younger, were so vastly different. My daughter would look at a drawing and tell me a story about the picture. She was always a “big picture” kid. My son, however, would look at it and would start pointing out the little details. He often missed the point of the picture because he was so caught up in the details. God, on the other hand, sees it all – the big picture and the details. Nothing misses His eye, We can trust that He has the big picture under control, and we can trust that His hand is at work in every single one of the details as well. Hallelujah! Christ Is the Rock on which I stand! He is the Alpha and Omega, the bright and Morning Star, the Great I Am, the Author and Finisher of my faith! It’s all Him — right where we need Him! So glad I’m not in charge. Whether our family is the one into which we were born, the one that raised us, or the one that God has given us through our churches and other places – amen! Family is a blessing. Sometimes that’s what we need, just enough to take the next step and trust God that He is the light showing us where to take that step to. What beautiful phrasing! Now I’m going to have to go find the whole poem. Thank you for sharing! And you are so right – God gives us exactly as much light as we need for that next step. And once we take that, He will light up the next step as well. Thank you for the lovely reminder! The poem is “Choruses from “The Rock””. It speaks about human kind and where have we put God in our lives. The sentence I quoted is on the end of it. It is a beautiful poem! One of my favorites..
“If God is for us, who can be against us?” Yes! An encouraging verse if ever there was one! Thank you for sharing. Hi Heather, I love your post!! Very inspiring! Blessings on you! Thank you for stopping by today Jackie! Blessings to you and your family! Thank you for your inspiring words. I’ve learned that God shows up in His time, not ours, and He is always on time. And thank goodness for that, right? We so often would change His time to suit our own wants, but God judges time by our needs, not our wants. We often get the two confused. But you are so right – He is always on time and always there when we need Him. This post is a great reminder that God knows when we need Him and shows up in His time to help. He’s always been there for me in my darkest hours and the storms of my life. I thank Him for all He does for me. Your words were so inspiring and so honest. Bless you. Thank you, Donna, for stopping by today! You are spot-on right. God is never late. He’s also not early – which sometimes aggravates us because we’d like to know in advance what He plans to do. But he is always, always right on time in our lives, and He never leaves us alone in the storms, in the darkness, or in our own confusion. Blessings to you! Even in the midst of the storm, I can trust Him :-) Setting my feet on the solid Rock assures me that I have an anchor when the waves are rolling and churning. I love that picture in my mind! 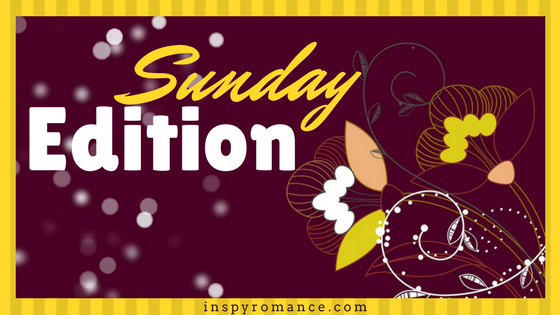 Looking forward to another great week on Inspy Romance! I didn’t get to read this yesterday because we were on the road, but you always encourage me! Dark times and the “wilderness” are hard to go through while you are in the midst. I often think of the song that tells me to rejoice in the wilderness (even harder to do) because God only wants to abide in me. I know they teach me many new things about myself, and about God, besides eventually helping me to grow closer to Him, to see Him more clearly. My fourth graders had their first test last week, and it was three pages long (a lot of blank space for them to fill stuff in), and when I passed the test out, every single one of them reacted with horror. “Three pages!” And I told them, “Hey, this is fourth grade. If you want easy, you’re in the wrong place.” That’s often the way we react to difficulty, though, isn’t it? With horror. But those fourth graders are going to get stretched, pulled, pushed, and grown this year – both academically and spiritually (I hope). And in nine months, they’ll be ready for the fifth grade. Then fourth grade work will seem like a piece of cake to them. Funny how that is, right? Every time God grows us through a season of challenge of difficulty, we get through it and look back and see how much God grew us during that time. That growth, though, is often in preparation for what’s to come next. Thank goodness God grows us patiently – sometimes in leaps and bounds, and sometimes in baby steps – but always with a goal toward preparing us for His purpose and plan. To always put my trust in God. Even when it feels like I ‘know’ what is best, I have to just remember that His plan is always best for me. Amen! We might feel a certain about what God is doing in our lives, and we might think a certain way about it, but God’s way is true and perfect, and sometimes we just need to step out of our own way so that we can experience the full blessing of being in the midst of His plan. I’ve learned that I spend a lot of time worrying during dark times and that the worrying ends up being a waste of time! God is always with me. Thank you so much for stopping by today Ellie! Worry…such an inconspicuous little word, yet filled with such anxiety. I was reading a book recently that differentiated between concern and worry. Concern is a godly reaction to things. We lock our front door because we’re concerned enough to be good stewards of the home God has given us. Worry, on the other hand (according to this book) is when we take it a step further and that home (or whatever we’re worrying about) becomes more important to us than God. When we lock our front door because we’re worried God won’t be able to take care of it, that He can’t protect it. I’m badly paraphrasing here – but in any event, it made me take a step back and look at the things I’ve been tempted to worry about recently (or in some cases have been seriously worrying about), and re-evaluate them and their importance and place in my life. I certainly don’t have all the answers, but it was a good reminder for me to put worry in its proper place. Blessings to you and your family!